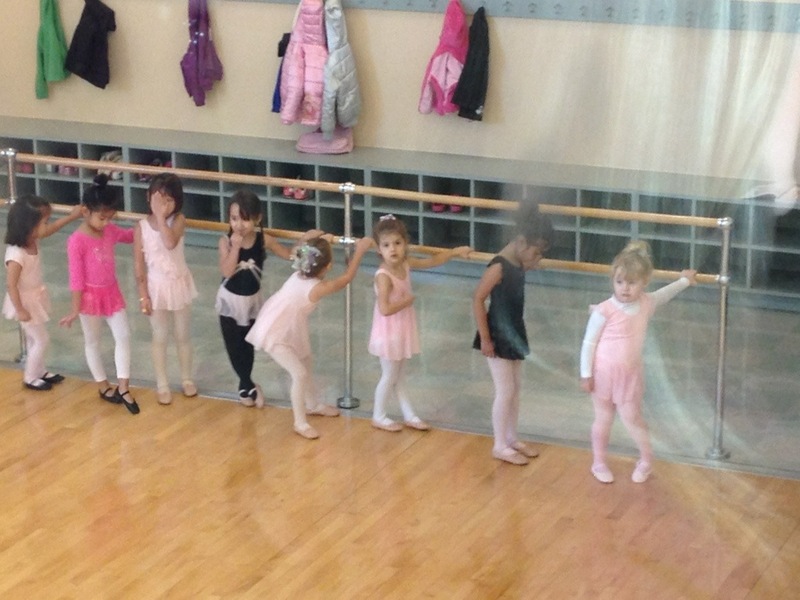 My daughter S. – Age 4 went to her first dance lesson this weekend. We did the whole nine yards: bought the pink ballet shoes, tights and leotard; I even put her hair up in a bun for good measure, not knowing specifically what to expect. I am not striving to be a dance mom. I never had dance lessons or even a single pair of ballet shoes. Mainly, because my kid seems kinda fascinated (if not, if I am honest, built for such things) with ballerinas and all things dance right now, I thought it would be fun for her and good exercise. Anyway. It was cute and sickeningly adorable to see all those little girls in their dance garb, trying to watch the teacher and raise their arms and point their toes. My daughter was far more interested in using the dance bar as a monkey bar, climbing the mirror and trying to hang upside down. I felt a sick gush of pride at her skill, and grateful the bar didn’t come crashing down. Even in that first class I did get exposed to some of the “dance mom” culture as they shouted “point your toes darling” to some of the girls and oohed and aaahed when their daughters did the right thing. I refrained from rolling my eyes or saying “For God’s Sake they are FOUR!” Instead, I just smiled as my daughter galloped across the dance floor with a complete lack of delicacy and a giant smile on her face. That’s what it is all about. It is amazing to me how simple children make the world seem if only we take the time to watch them. We go to fall festivals with enticements like “pony rides” and “petting zoos” and there is nothing wrong with that. 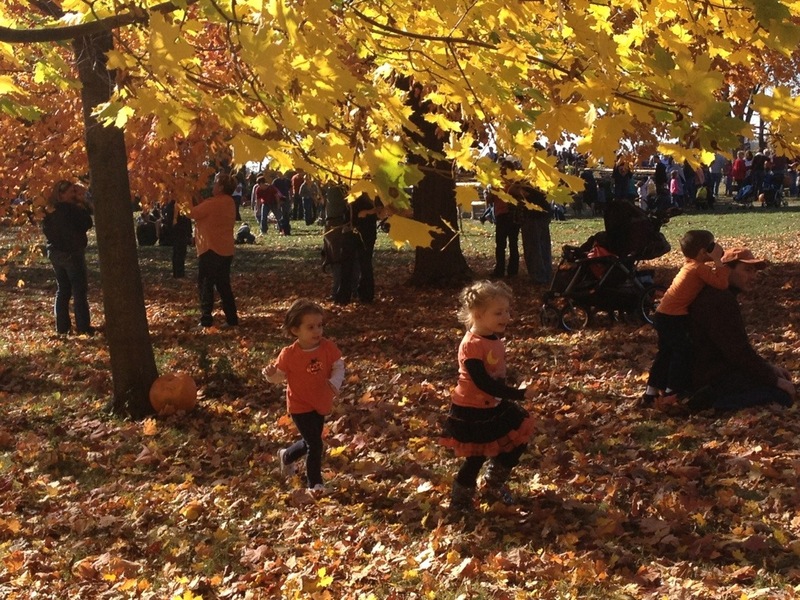 But at the same time, give kids some pumpkins, leaves, sticks and some room to run around and they are just as happy! The games they make up on their own when left to their own devices are hysterical! 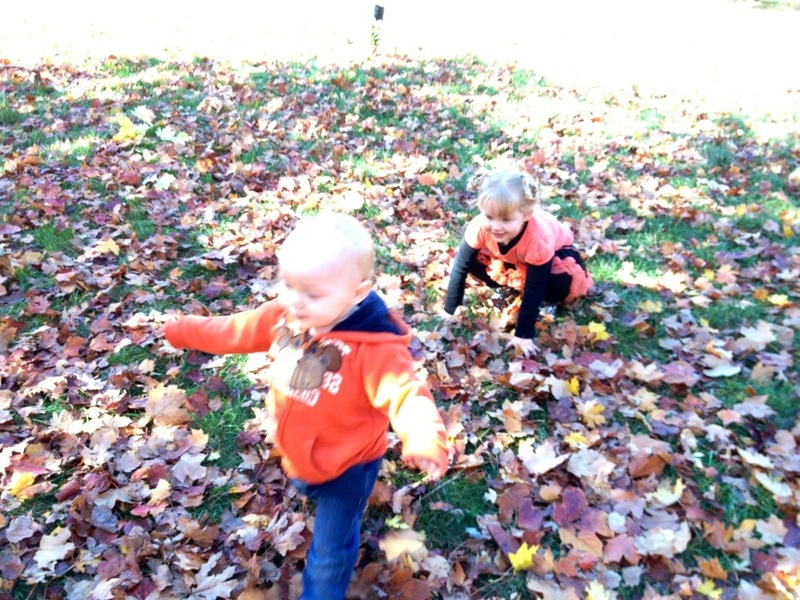 If only we as adults could remember how to be that happy to be alive, and to find so much possibility in a mere pile of leaves! I remember when I was a little girl in school my friend Harla and I wrote a play for reading class called “Maggot Rice”. The script was just as disgusting as it sounds. The play was complete with a bag of fake vomit (truly inspired) and ghastly wrenching sounds and was the hit of the school. Super funny stuff! When it’s your kid, especially the one who can’t even talk, it’s far less funny: gross yes, vaguely reminiscent of clam chowder (except with chunks of orange in it) yes – disgustingly clumpy and all over my clothes and foot, yes. Scary, yes. Funny? No. You panic and worry. You feel horrible for them and helpless. Watching anything bad happen to a child is terrifying. As you might guess, my son got ill tonight. He seems better and is sleeping peacefully. I will undoubtedly be lying in bed, awake and listening for much of the night. I wonder if Dora ever does a show about getting sick? I wonder how you say vomit in Spanish? I feel I may have reached a new parenting low. Children’s programming has taken over my mind. Many 4 year olds girls are princess-crazy, pink and purple covered, rhinestone-bedecked floozies. If it doesn’t have a wand or a crown, they don’t want it. Everything is poofy and cute and rainbow-riffic in their worlds and that is the way life is supposed to be. I should know: my daughter goes through phases of this frequently, and has on previous occasions even brought her crown to bed with her. She does however, have a dark side to her sweet innocence: She loves Darth Vader. S. – Age 4 knows Darth is not the good guy, but I think she feels sorry for him and thinks that he is lonely. She also has an appreciation for Yoda, but Darth Vader she has up there with Batman and Ironman when it comes to colorful super characters, and Darth is the only one she always blows kisses to at the parade. Anyway, one of our weekend bits of fun was pumpkin decorating, and we were able to put some of that Star Wars fun into it. 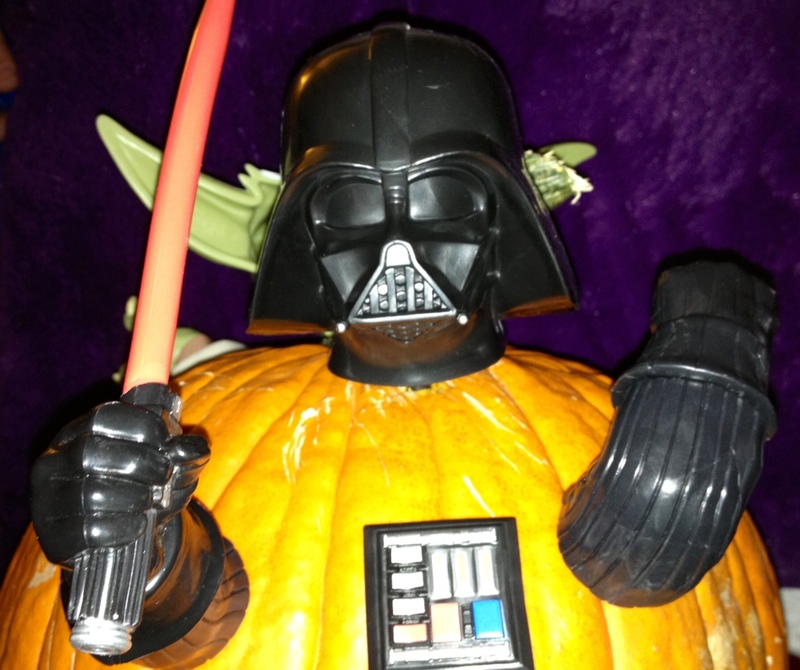 Meet Darth Pumpkin! My daughter was delighted!! 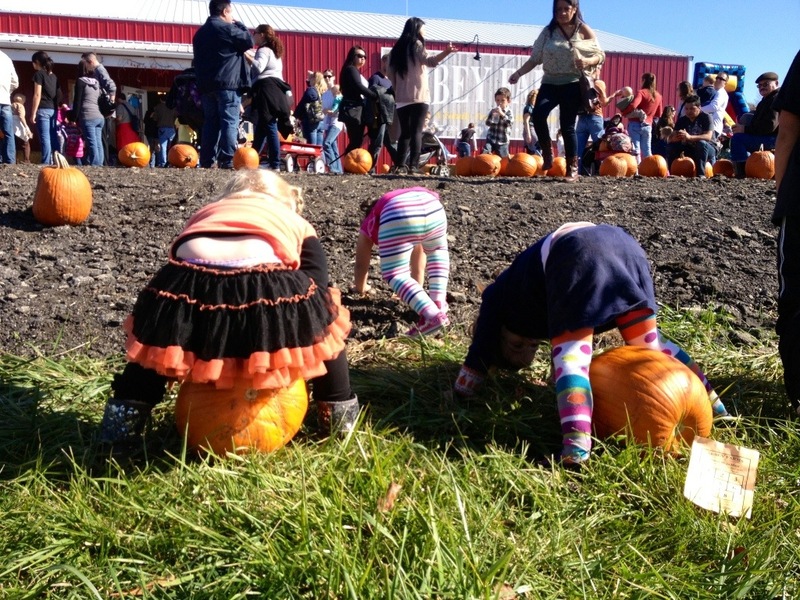 The green you see in the back is actually the Yoda on the other side of the pumpkin so that the forces of good and evil have some inter-gourd balance. 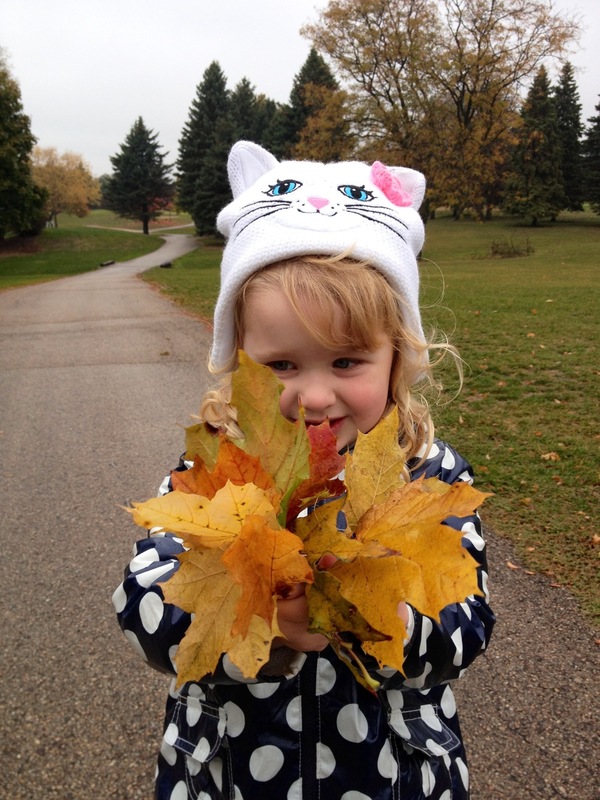 Happiness is a big pile of glistening yellow and gold cold, wet leaves found on a trip to the backyard with mom. It is also knowing that in this one fragile moment the world and the sky and the trees are all hers, and adventure is everywhere she looks and hers for the taking. I simply smile, and watch. 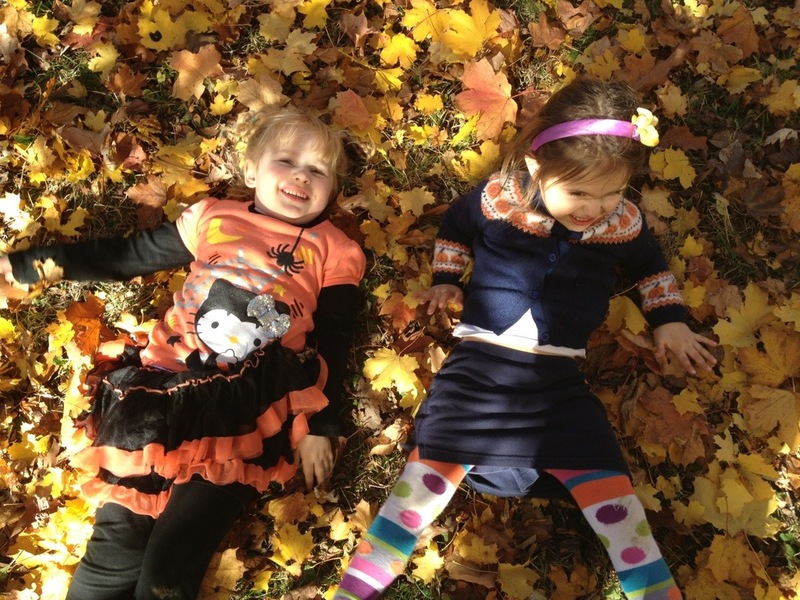 My daughter is now S. – Age 4 instead of S. – Age 3.5, and I admit, I am fighting off a bit of sadness and anxiety. 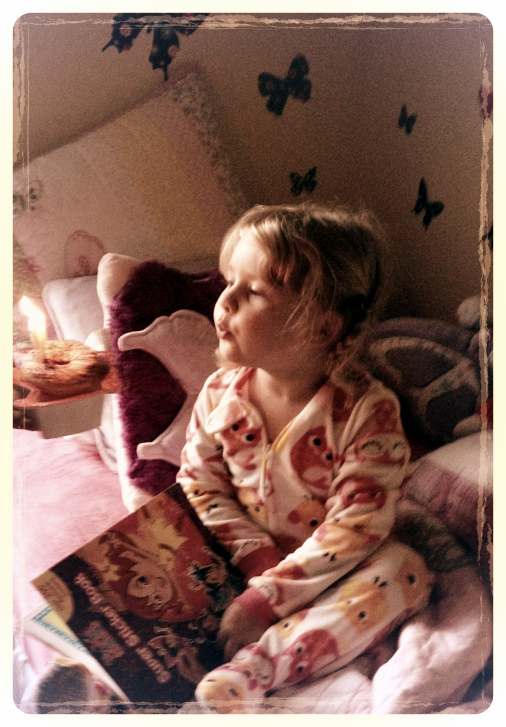 Her birthday was celebrated with sugar and fire (a la candle in donut as is tradition in my family among my sisters) and much fanfare, but after the stress of parties, etc. I fear my unchecked mind has had a little too much time to think. My daughter becomes more interesting every day: drawing new things, creating amazing and bizarre stories in her head, pulling the most peculiar and yet somehow sensible logic and applying it to her world in the most fascinating ways. She has a memory like a fox for the most bizarre of details, loves music and art, and has an affinity for kindness and love that seems endless. Her beauty is becoming more mature, and at times I think I see glimpses of what she may look like even years from now with stunning clarity. Don’t get me wrong: she can out-drama most 13 year olds and attempts Machiavellian schemes with maddening skill – and half the time has me pulling out my hair – but that is besides the point, and I am secretly proud of her more clever attempts. I fall more in love with this kid every day, but at the same time, it is the realization of how quickly time passes, and how short a time I will really have with her, that floors me. 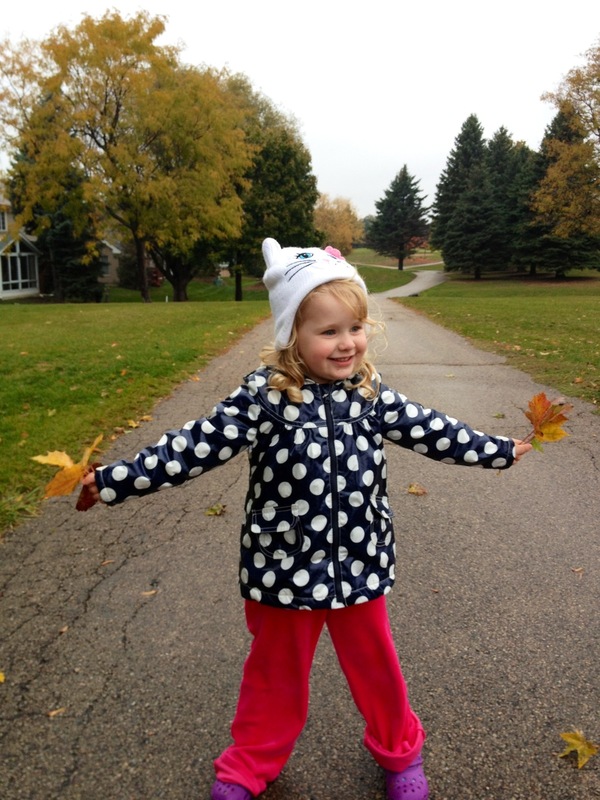 I feel lucky and priviledged to have this child in my life – with all her blessings of hope and wonder at the world, and with it grows so the fear of its changing and moving on. I am a mommy with pre-abandonment issues. On the last night of her third year, I admit I crawled into her little twin bed with her in the middle of the night, under a halo of butterflies and happiness and just laid there staring at that tiny face trying to soak it in so I would not forget any detail. I push my fear to the background and try and focus all on my hopes for her future, and joy for my present with her – our present with her. 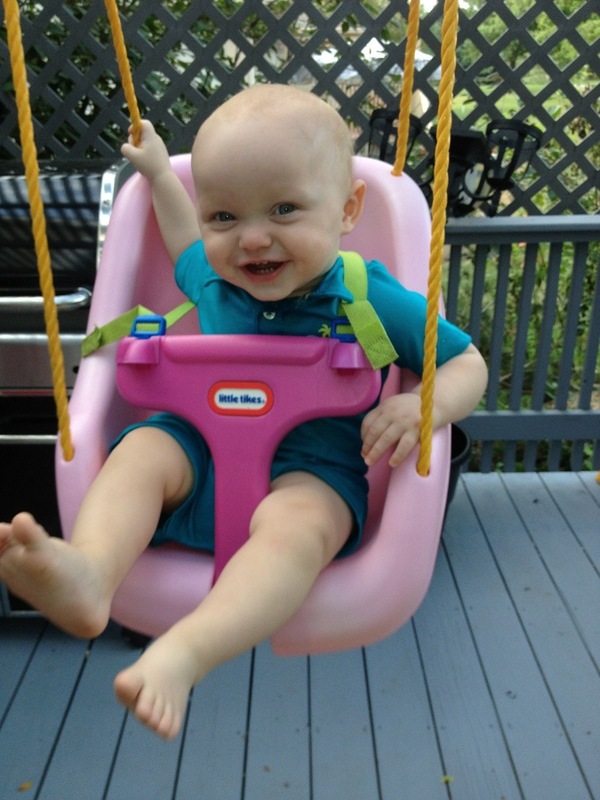 She fills my house with love and madness, and is adored by her baby brother and parents. I must rejoice in this, and tell myself constantly that S – Age 4 will be even cooler, and that butterflies must be allowed to soar to truly live. I am one blessed mama. I haven’t posted in a few days – partially because of the need for both hands: my little boy, T. – Age 14 months is all over the place. If I am not removing him from one dangerous location or another, I am extracting objects from his mouth! 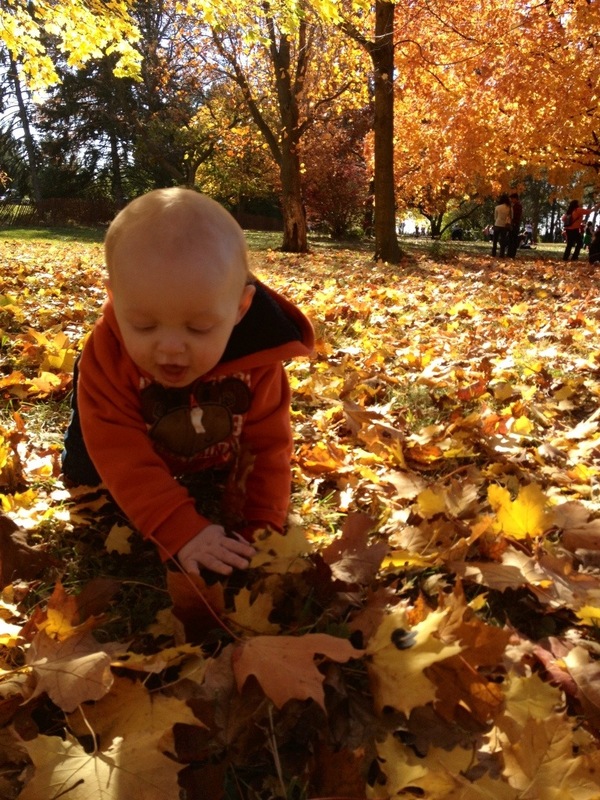 As parents with a baby or toddler, there are many things you think you should be discussing. Perhaps you might talk about parenting strategies, or growth charts, or even your hopes and dreams for baby. In my home? Somehow we are always talking about poop. Real men are OK with pink..
Because we had not found out what we were having with – well – either of our children but especially with the first, all of the baby stuff was pretty gender-neutral. 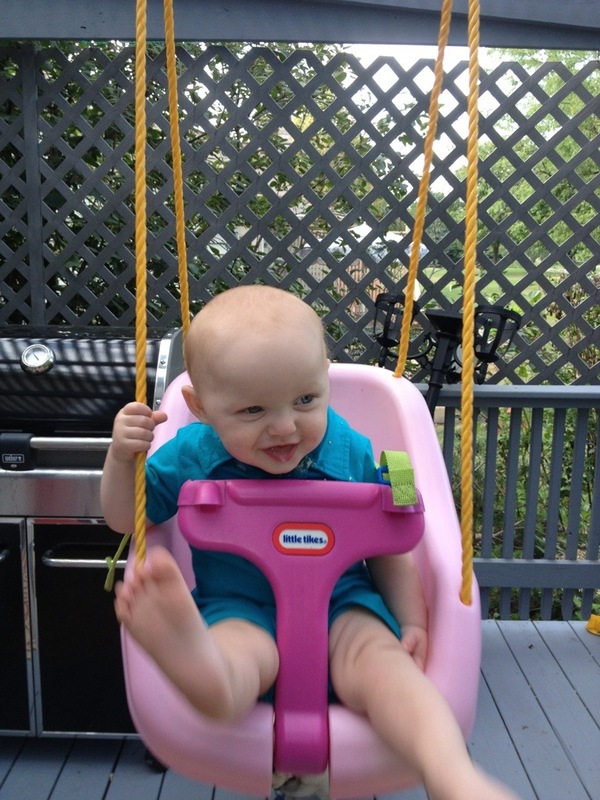 So when we got our precious baby girl, and she was old enough for her first baby swing, I pushed for pink. Truthfully, I think, I had figured, coming from a family of predominantly girls, it would not matter: clearly I would also have girls. Which, of course, didn’t happen. 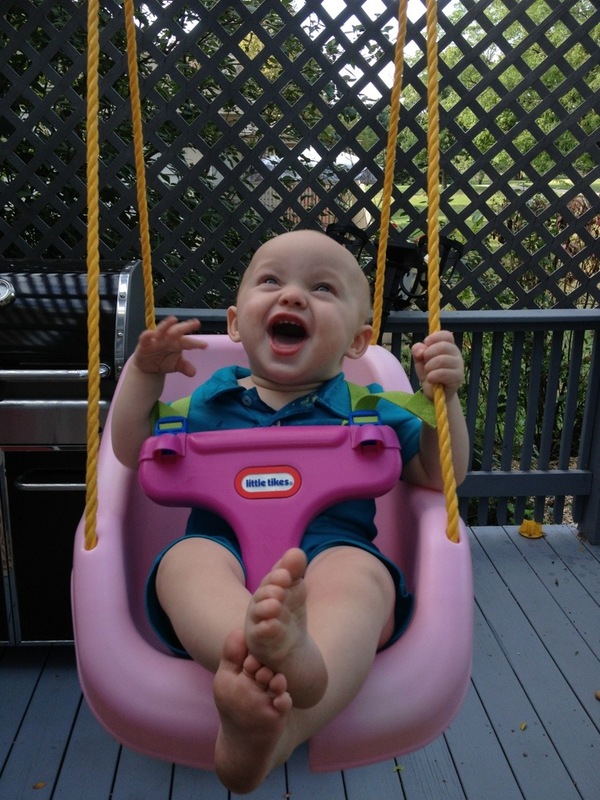 And now that my son is old enough to enjoy such wonderful things, we are too cheap to buy another swing.